1 How to win Rs 6000 from Amazon Nevi Quiz? 2.1 Ques 1) Which kind of jewellery is used to propose a partner for marriage? 2.3 Ques 2) An anklet goes around what part of the body? 2.5 Ques 3) A diamond is what in its most pure form is made up of which element? 2.7 Ques 4) The Kohinoor, one of the largest cut diamonds in the world, was only worn by female members of the British Royal family because it is believed that it brings bad luck to any man who wears it. 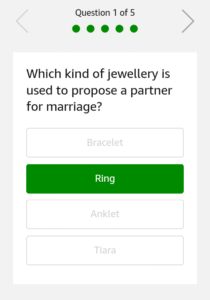 This Valentine Day, Amazon added a new quiz to its list, as Amazon is conduction Amazon Nevi Quiz and we added Amazon Nevi Jewellery Quiz Answers. A total of 15 winners will get Rs 6000 worth hamper. We added all the answers of Amazon Nevi Quiz. So, just read this post and answer 5 simple question and win Rs 6000 worth hamper. This Quiz at the last of the Homepage in the Amazon App. You will see the above shown image of Amazon Nevi Quiz. How to win Rs 6000 from Amazon Nevi Quiz? 2. 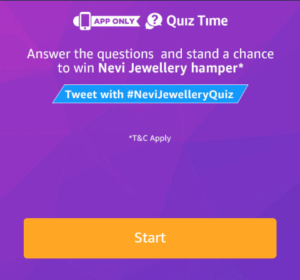 Open the app and you will see a banner about the Nevi Jewellery Quiz Time contest. Click on it. 3. Now click on the ‘Start’ button to begin the Amazon Nevi Jewellery quiz. Ques 1) Which kind of jewellery is used to propose a partner for marriage? Ques 2) An anklet goes around what part of the body? Ques 3) A diamond is what in its most pure form is made up of which element? Ques 4) The Kohinoor, one of the largest cut diamonds in the world, was only worn by female members of the British Royal family because it is believed that it brings bad luck to any man who wears it. 5. After answering all 5 questions correctly. That’s it. 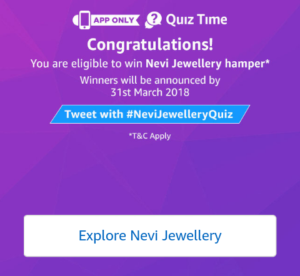 Just wait for the Winners list of Nevi Jewellery Quiz. This Contest will commence on 14th February from 12:00:01 a.m. (IST) to 10th March 11:59:00 p.m.
Once you have signed-in to the Amazon.in App, you can participate by navigating to the page where 5 questions will be posted during the entire Contest Period. A total of 15 participants will be selected as winners of the Contest. The declared winner(s) will be eligible for winning Rs 6000 worth Nevi Valentine jewellery hamper each.